We'd like to introduce you to Tessie, Mulberry's latest handbag line and its inaugural move toward making more-affordable products. 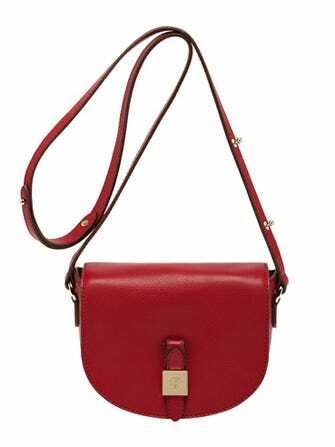 Priced at $860 for a small satchel, $990 for a larger satchel or tote, and $1,190 for a hobo, the models can be purchased in red, black, oxblood, or oak soft-grain leather (and some in a midnight blue, croc-striped suede) when they're released into the wild later this week. Tessie "was inspired by the effortless practicality of our early collections, when each new bag was created with a use in mind," a Mulberry rep. told British Vogue. "We think the styles are both classic and practical, each finished with belt buckle and strap detailing that references our early design signatures." Ole Tess arrives at a trying time for the brand — which issued two recent profit warnings and reported falling share prices, according to the Telegraph — and "will act as a sincere bid to boost the company's growth." The trade continues, "While £495 ($860) for a compact shoulder bag represents a significant reduction for Mulberry, it doesn't take the brand close to the designer 'entry-point' category offered by the likes of Marc by Marc Jacobs, Michael Kors, and Coach, all of whom offer accessible and functional designer handbags for less than £300 ($500)." Tough break, Tessie. Well, a 'Berry by Mulberry for Mulberry in collaboration with Mulberry line is always a possibility.